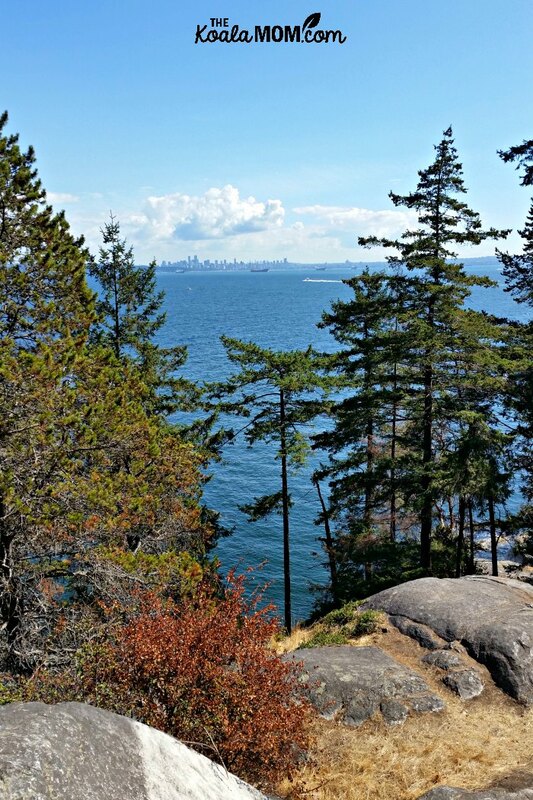 Lighthouse Park in West Vancouver is a scenic, beautiful park that offers plenty to explore. Trails wind throughout this natural area, crisscrossing the cool, shady forest and dipping into the beaches or climbing to rocky cliffs. 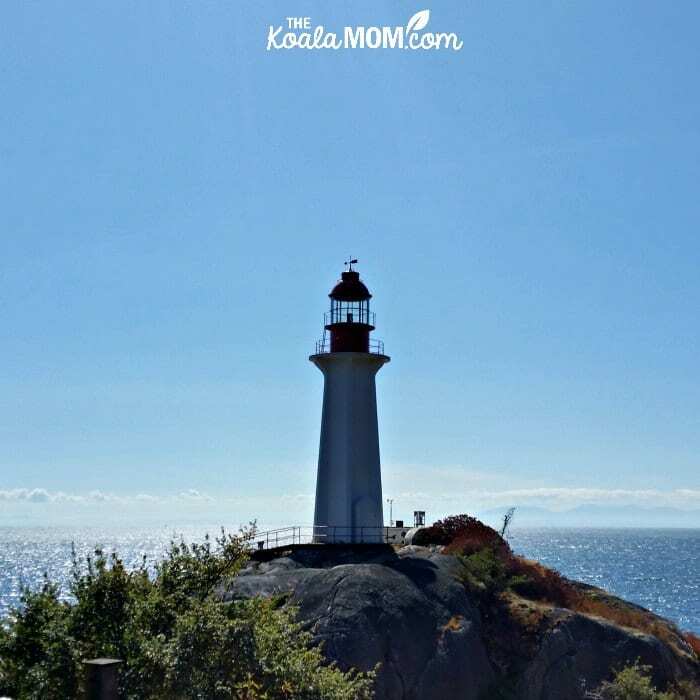 There are plenty of picnic areas and Instagram-worthy photo opportunities, as well as local history and, of course, a lighthouse. 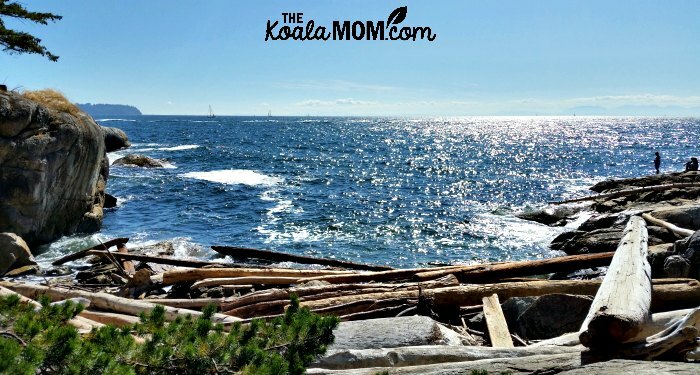 Lighthouse Park is located on a peninsula that juts out into the ocean from West Vancouver. While there are signs to help you find the park, Google maps is definitely helpful as you meander through the community on narrow roads before arriving at the parking lot. 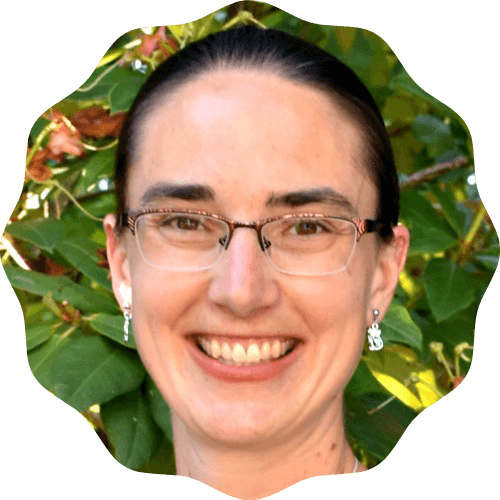 Be aware that the parking lot is extremely busy on long weekends, and you may have to park further away and hike in or take transit to the park. Once you’ve found parking, there are several trailheads, depending on your destination. Maps make it easy to pick where you want to start. The main trails are wide and well-maintained. Some of the side trails are narrower. We had Joey in a baby carrier when we visited, but a friend of mine has taken her stroller there. If you do, you’ll want to stay to the main trail but you can still see much of the park, including the lighthouse. 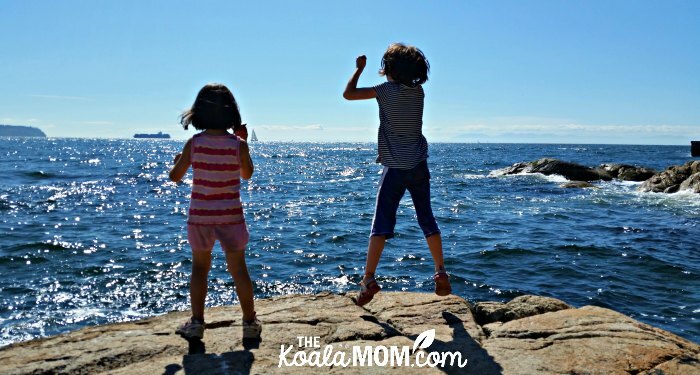 The cliffs and beaches of Lighthouse Park offers unparalleled ocean views. We followed the main trail from the parking lot to the historical buildings, then took a left to follow the trail to the beach. It was fun to sit on the rocks looking across the water at downtown Vancouver. Big boats sat on the water while smaller boats zipped back and forth. A kayaker went past in the wake of another boat, hugging the coastline until he was out of sight. The girls would have spent an hour or more at this small beach. 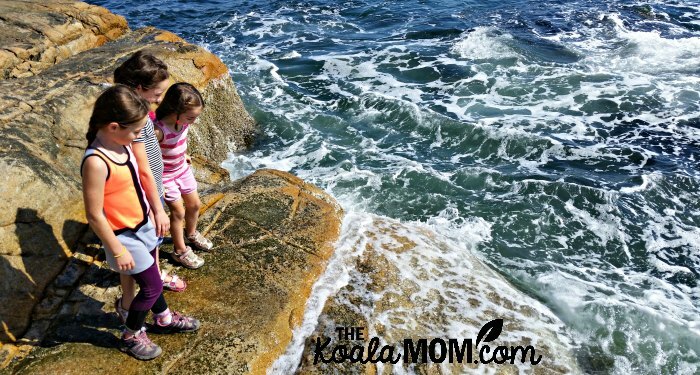 We clambered over the rocks to look in the tide pools at the top. Waves drove spray up over the rocks into our faces. Down on the beach, there were the waves to play in, the driftwood to examine, or crabs to find. Since we’d just arrived there, we didn’t let the girls play at the first beach for too long. My husband and I wanted to see what else the park offered. I’d definitely recommend packing a lunch and planning to explore and play there for a full day. 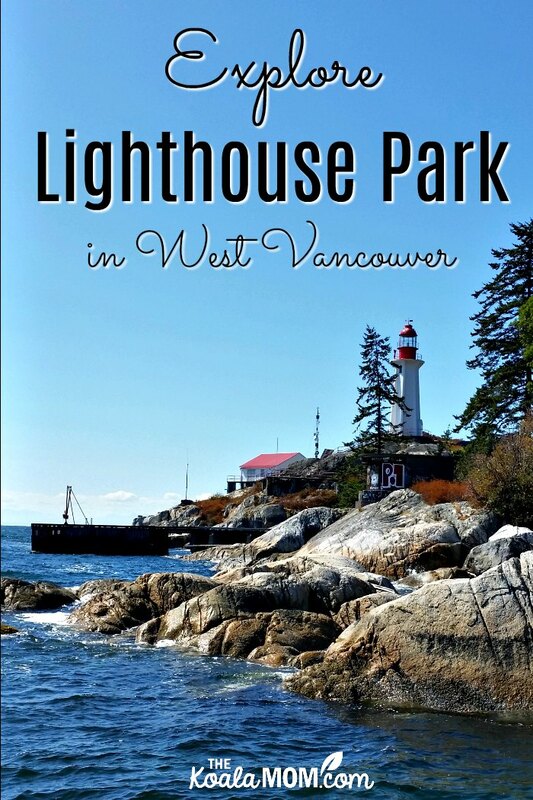 Lighthouse Park sits on Point Atkinson, named by Captain George Vancouver, on the Burrard Inlet. The 185-acre park was created in 1881 to create a dark backdrop for the light, making it more visible to ships. The first lighthouse was built there in 1874 and lit the following year.In 1912, a new hexagonal tower was built, along with a new keeper’s house and fog alarm. This lighthouse is still in operation today. As the focal point of the park, Point Atkinson Light was one of the most popular areas of the park. We had to wait our turn to get a picture of the lighthouse. A sign nearby gave us some of the history of the area. 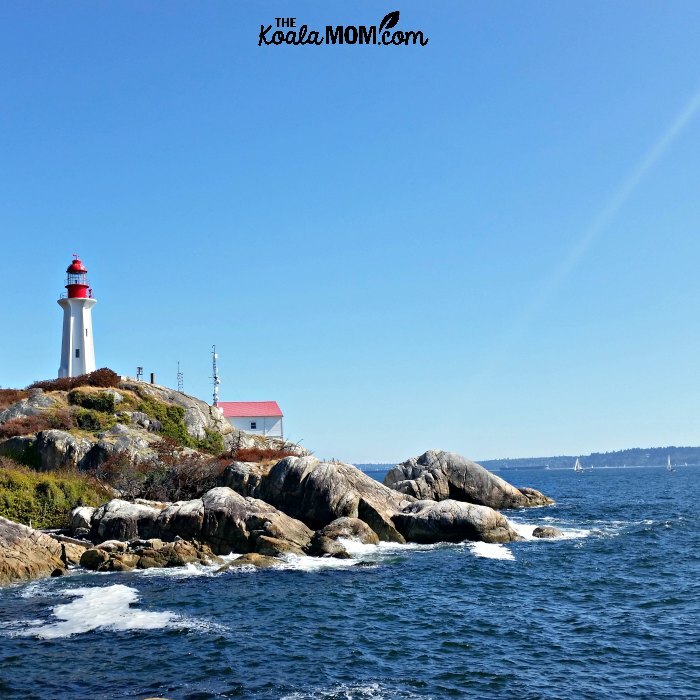 Now, the lighthouses we’ve visited are in scenic areas that are easy to get to. It’s hard to imagine how difficult the life of a keeper was when the light was built far from the city, or what it would have been like to maintain the light by hand in all weather. 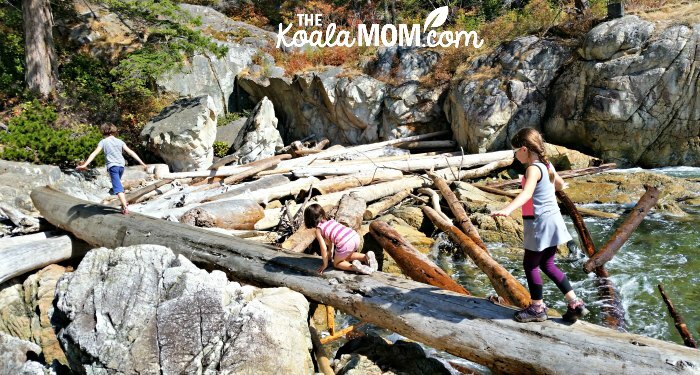 The girls had a lot of fun using one huge piece of driftwood as a bridge. They went back and forth across this, first scooting across it on their tummies or bums, and then slowly gaining confidence to stand up and walk over. We could also see Point Atkinson Light from here. It made a great landmark while exploring the park. It was also a scenic photo backdrop. However, none of our attempts at a family picture turned out very well because the sun was too bright! Even Joey wanted to get down and explore the rocks and tide pools. 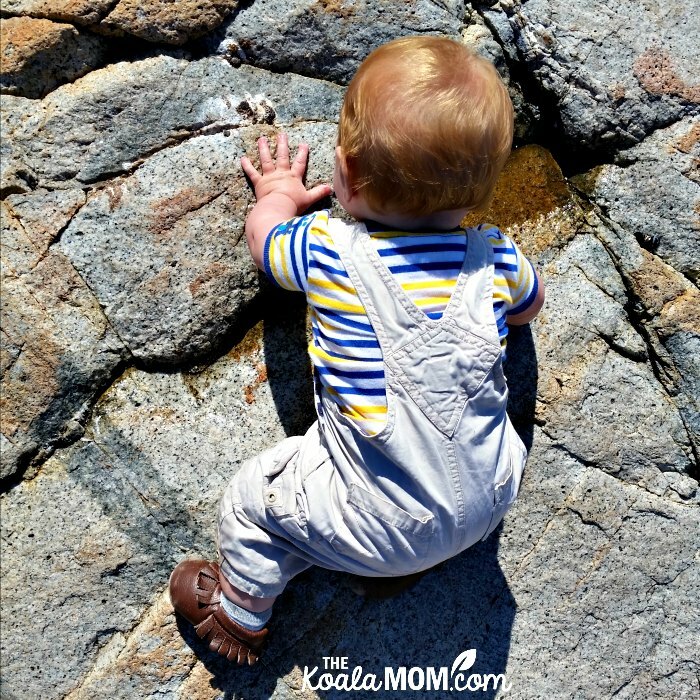 It was a good thing I’d put his baby moccasins on to protect his feet from the rough rocks! We hadn’t planned to go hiking that day, actually, so he had better footwear than I did! I walked the whole trail in my Naot sandals. Finally, we headed back to the shady forest trail. Pearl and Jade took turns asking Daddy for piggyback rides. One of the things I loved about this park was the changing scenery. The forest is mossy, cool and quiet, compared to the bright beaches where the waves splashed against the rocks. It was easy to see why the park was so popular with so many people. 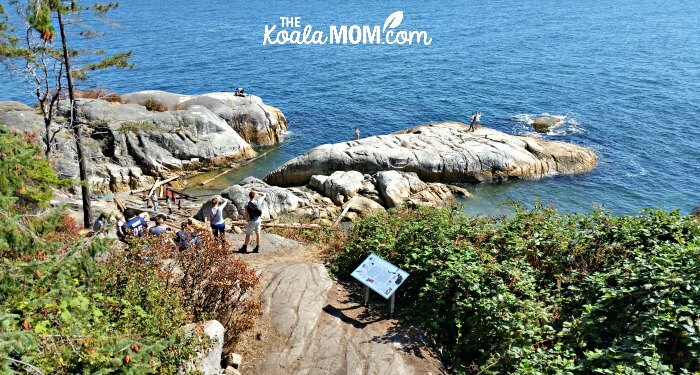 If you do go to Lighthouse Park, I recommend taking a small daypack with snacks and a water bottle (or more). 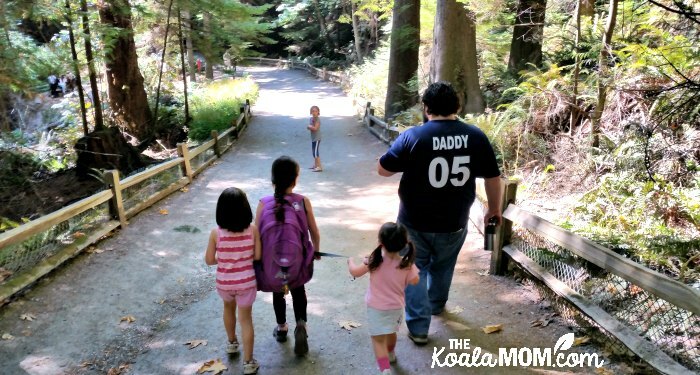 Even if you’re just doing a short hike there, it’s handy to have some water and food for the kids. We actually ended up there on a whim after our other plans for the day didn’t work out. Sunshine had packed her backpack full of library books, so we took the books out and used her backpack for a daypack. And I always keep baby carrier in the van, so I could carry Joey. There are outhouses located along the trail and washrooms (with flush toilets and sinks!) in the centre of the park, among the old barracks. Want to learn more about lighthouses? Disney’s animated movie Pete’s Dragon is a fun story about a boy adopted by a lighthouse keeper. It’s an old-fashioned lighthouse that still needs to be refueled and kept lit. 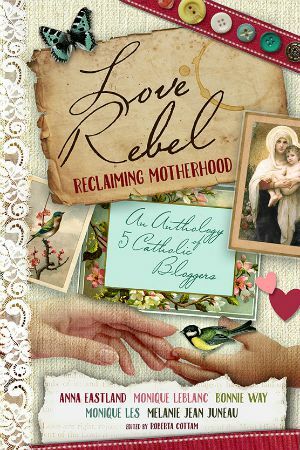 Moms, check out Lisa Samson’s novel The Passion of Mary-Margaret. One of the characters is a lighthouse keeper and part of the novel takes place near the light. 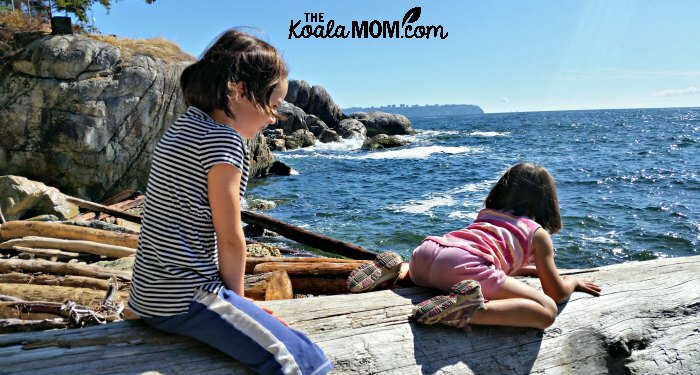 If you enjoyed exploring Lighthouse Park, check out my list of 12+ Family-friendly Hikes around Greater Vancouver for more ideas!